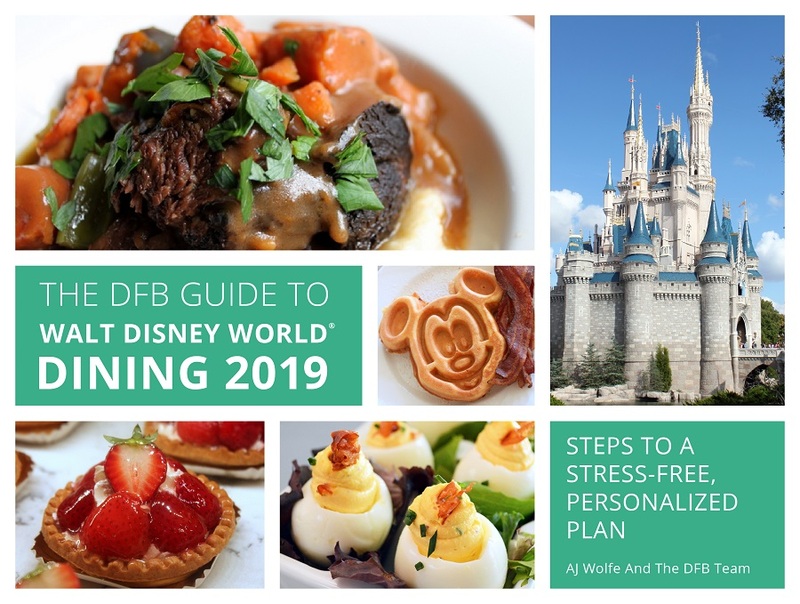 We’re often struck by the interesting names Walt Disney World devises for attractions, rides, and restaurants, and we know lots of you are, too. 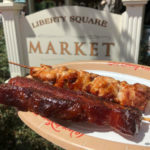 So we’re taking a look at some of the most clever Disney World restaurant names — and why they’re called that! 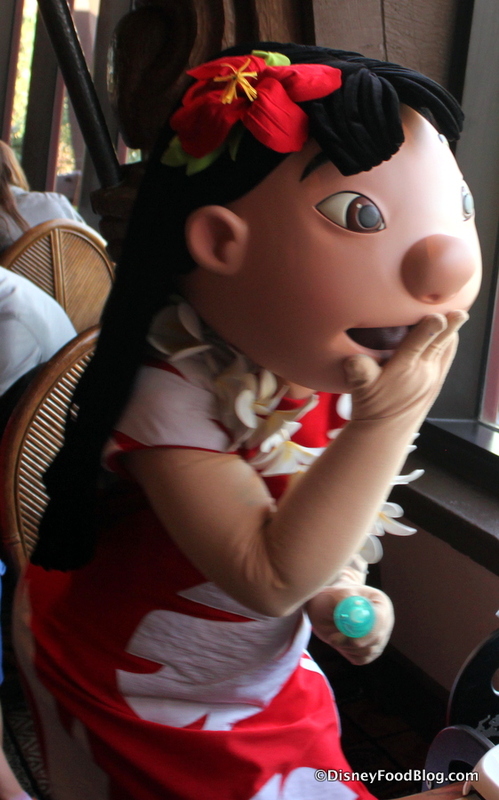 If you haven’t visited this popular table service restaurant in the Great Ceremonial House at Disney’s Polynesian Village Resort, you might think the name comes from Disney’s animated hit Lilo & Stitch, but in truth, the restaurant came first! (Although you can meet Lilo and her ‘dog’ Stitch at breakfast!) And at ‘Ohana, it’s all about family. That’s because ‘ohana means family in Hawaiian! 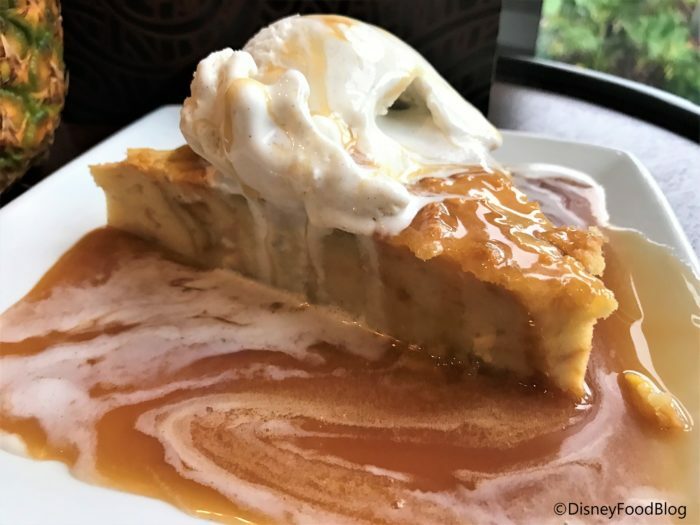 Get the recipe for ‘Ohana Bread Pudding here! You know where we’re going with this one! Whispering Canyon sounds like a peaceful spot to explore in the wild, right? But at Walt Disney World’s Whispering Canyon Cafe, whispering is not on the menu. 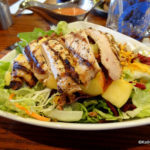 Though the restaurant’s antics have a bit of a hit-or-miss quality right now (see our dinner review for our take on this), traditionally Whispering Canyon Cafe has been loud, raucous, and full of fun. 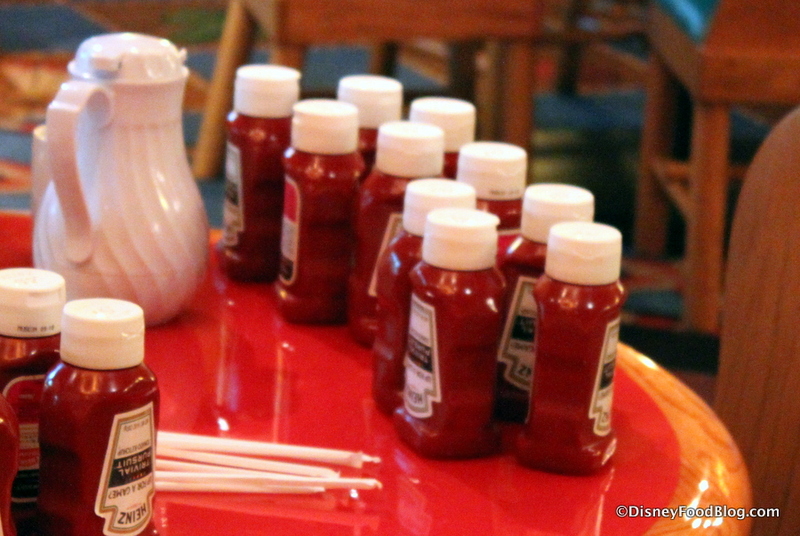 Ask for ketchup, and you get all.the.ketchup. Someone Asked for Ketchup . . . Turns out irony is not dead — and Whispering Canyon is keeping it alive! From pony races to giant cups of soda, when the antics are on, this restaurant’s name becomes part of the joke! When Homecomin’ came to Disney Springs, that meant one thing for lots of guests: Fried Chicken. That staple comfort food is a Chef Art Smith specialty, and we knew it would be delicious. Less certain: the restaurant’s name! 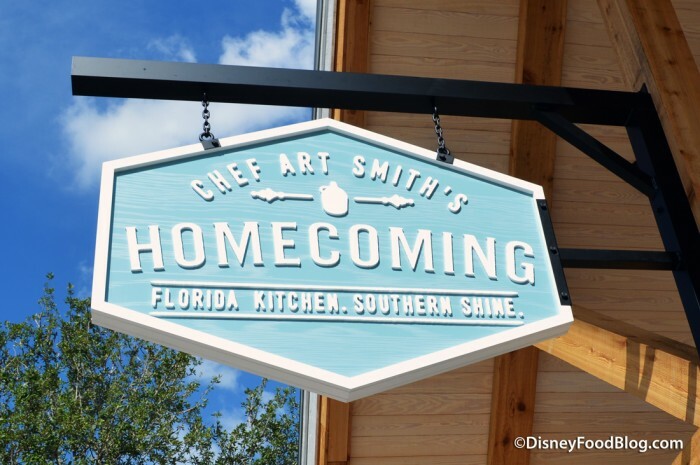 It started as Chef Art Smith’s Homecoming (with Florida Kitchen Southern Shine tacked onto the end). Here, the Florida Native and James Beard award winning Chef Art was literally coming home to launch this new Florida restaurant. But just over half a year later, the ‘g’ was dropped, an apostrophe added, and Homecomin’ was born. Homecoming Sign — back in the day! The new moniker was a dialectical and tonal change, bringing the name more in line with the restaurant’s overall style and vibe. 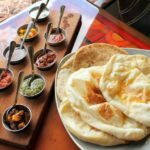 The laid-back atmosphere and menu full of comfort food mean you can drop your ‘g’s and relax! 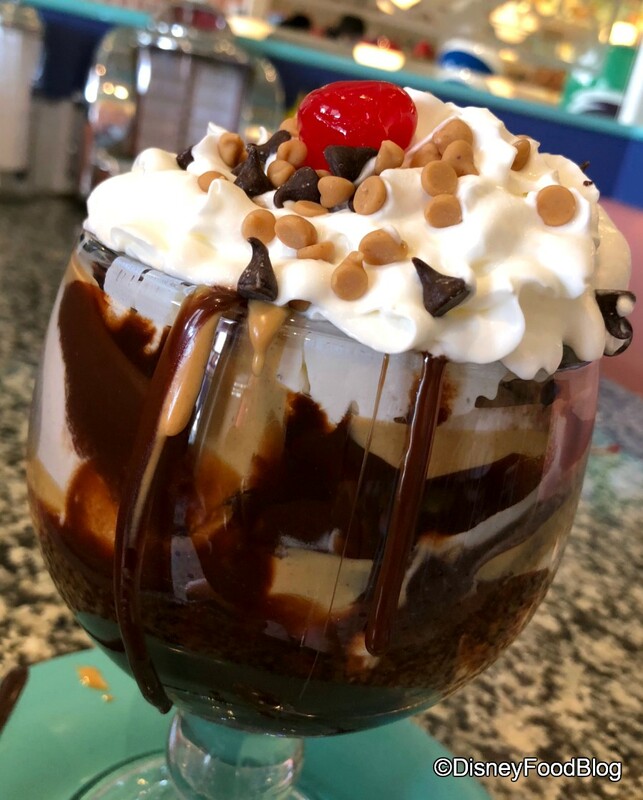 Beaches & Cream is a popular, old timey soda shop that specializes in classic food like grilled cheese and tomato soup and wows diners with massive sweet treats like the No Way Jose sundae. Beaches & Cream is a play on peaches and cream, a simple, soul-satisfying dessert that provides comfort and familiarity to those who love it. Beaches & Cream manages to evoke that comfort while also identifying its location (at the Beach Club!) and giving a hint to its signature treats (ice cream galore!). That’s three connotations in one clever name! Victoria & Albert’s is a historically interesting name, inspired by Queen Victoria and her husband, Albert, Prince Consort. The Victorian Era, named after England’s second longest-reigning queen, was the height of power for England and was characterized by richness, exclusivity, and conservativeness. 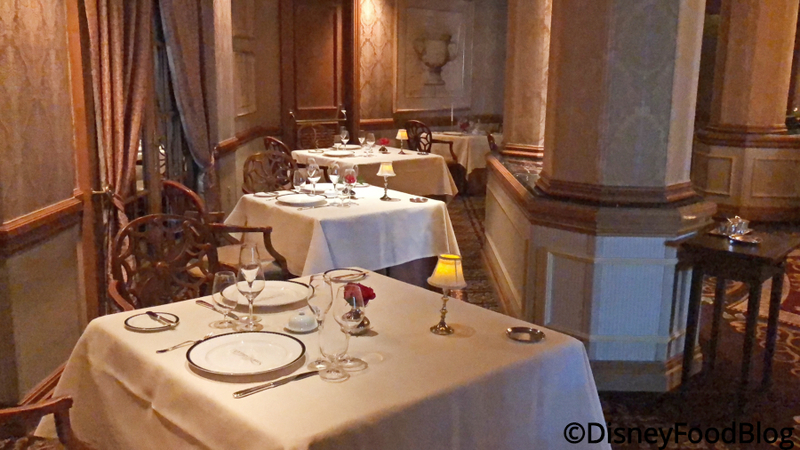 Disney’s award-winning Victoria & Albert’s is all that and outstanding food. 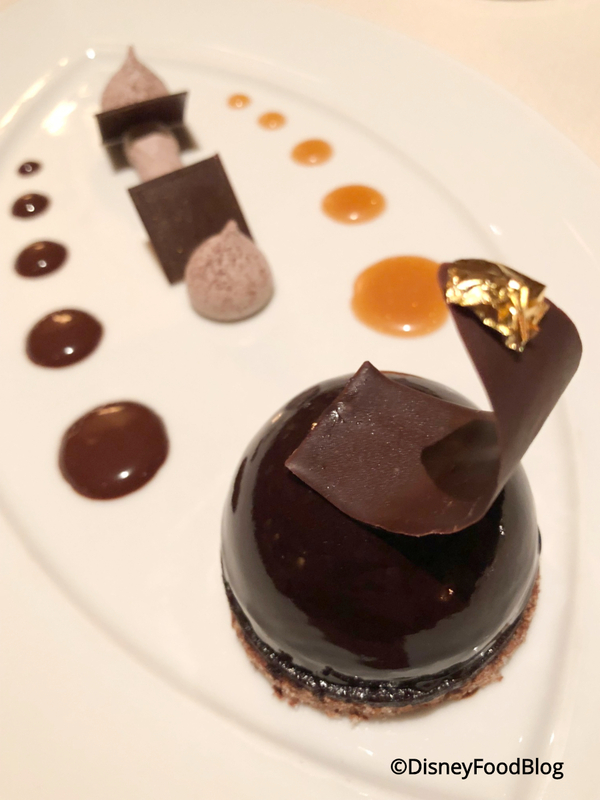 Dining here is pricey even by Disney standards, but the service, food, and overall experience are top-notch — not just at Walt Disney World, but in the actual world (we’re talking AAA Five Diamond Award, James Beard Foundation Award nominations for Best Chef South, etc!). Like the queen for whom the restaurant is named, Victoria & Albert’s strives for prominence in the world and finds it. Click here to read our most recent review. Interestingly, for years the restaurant referred to all of their servers as either “Victoria” or “Albert” depending on their gender. The practice has, thankfully, been dropped. 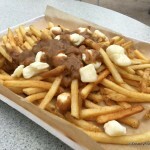 Le Cellier, je t’aime. In this case, the language and the translation matter. Le Cellier reflects Canada’s rich French Canadian heritage, but it uses a term that won’t scare anyone off because this isn’t a fancy French restaurant; it’s the cellar! 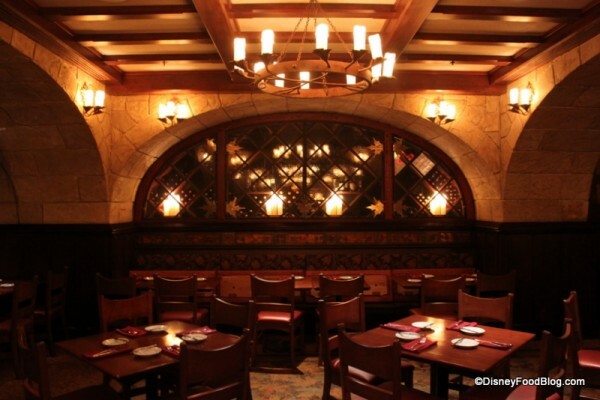 Le Cellier matches the expectation set by its translation in the decor, which plays with arches, light, shadow, and stone to create a moody dining space. 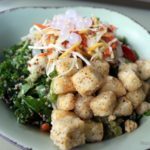 The food, we’re happy to say, is typically good, which is why this restaurant is so popular (despite the steep prices and two-credit requirement on DDP!). And, bien sur, there’s plenty of poutine. 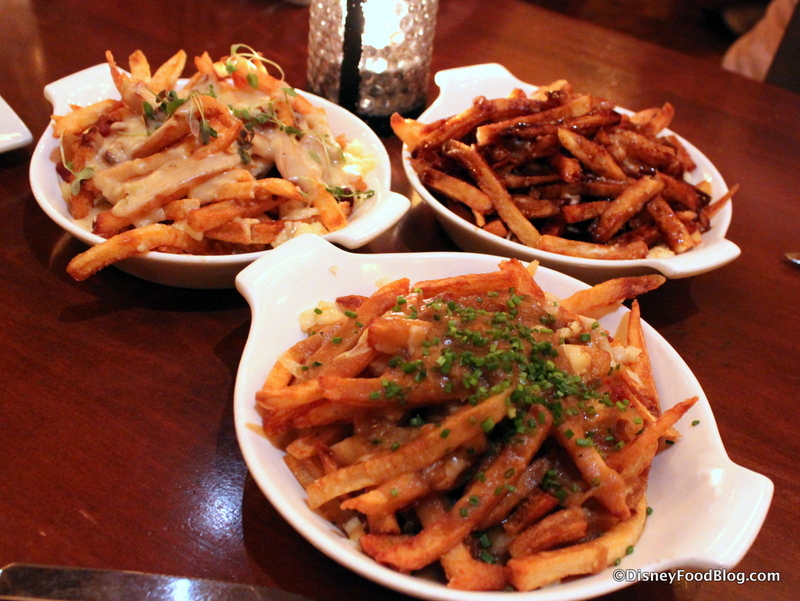 See what we thought in this review of three types of this Quebecois delicacy! Tangierine Cafe is another wonderful place name that provides a frame of reference for the restaurant it identifies. Tangier is the third most populated city in Morocco with nearly one million residents, and it’s been an important port for centuries. In fact, the fruit tangerine took its name from this city. And now you see how Tangierine Cafe is more than a clever place name; it’s a play on words, too. 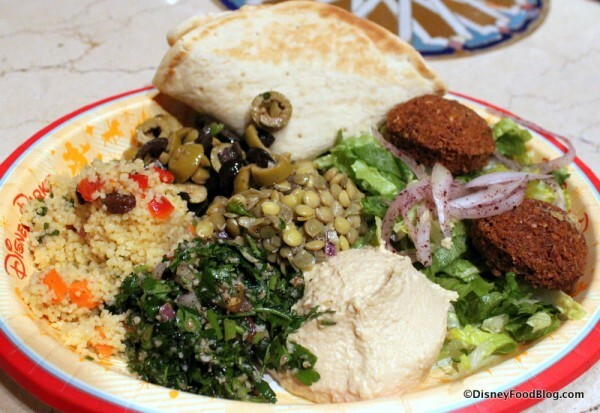 The food at Tangierine Cafe reflects the popular foods of Morocco (and the wider region) and has a freshness that is, perhaps, also implied by its fruit-themed name. And we are big fans of this quick service spot as an alternative to more traditional theme park fare. Vegetarian Platter at Tangierine Cafe in Epcot’s Morocco Pavilion: is it right for you? 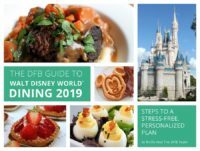 Click here to browse through our 2019 Disney Restaurant Ultimate Guide! 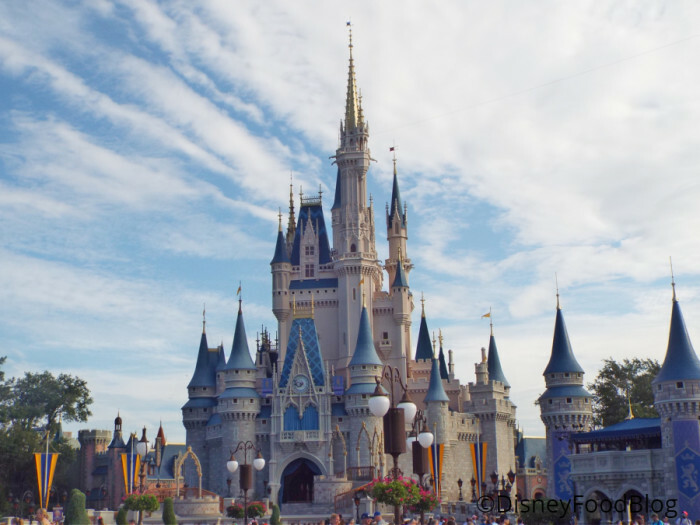 Which restaurant name is your favorite at Walt Disney World? Let us know in the comments! « FIRST LOOK: We Go INSIDE Disney’s Skyliner Gondola! Ventilation, Wheelchair Accessibility, and Seating Questions Answered! A wonderful inspired idea. Just like the gondolas used at Ski Areas like Whiteface Mountian NY. They are speedy and much more efficient tan a bus. Probably a gondola every 15 to 20 seconds, each taking up to 10 people. That is a bus every minute. I will be there in December and can’t wait to try it out.